For the love of life: JustRite Papercrafts June Release day 3! JustRite Papercrafts June Release day 3! Good Thursday morning and welcome to another day of JustRite Papercrafts June Release hop. Our fabulous design team has been so busy to create with these fabulous new stamps and today we are showcasing more christmas stamps. How fun is that!!!! Today's set is called Christmas Vintage Labels One, which coordinates the Spellbinders Vintage Label and Banner Dies. My background was created using the Lattice Background Stamp, which I white embossed onto kraft card stock. I just love that look. I used that same look to create my label as well. It just looks like a snowy label to me and I really like that look for Christmas. 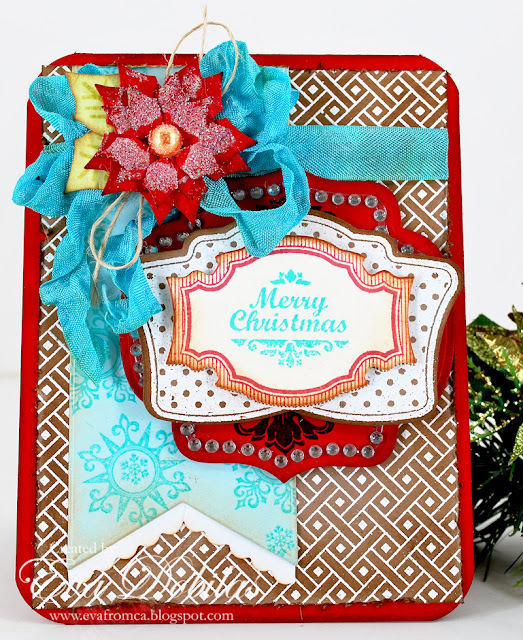 My pretty poinsettia is also by Spellbinders called Layered Poinsettia. The fishtail is by My Favorite Things Die-namics Fishtail dies. My sketch is from this week's Mojo Monday. I fell in love with it as soon as I saw it and I knew I could find a card to use it for. My pretty ribbon is seam binding ribbon, which you can get at Stamp Simply store. Sharon has a ton of colors and they are only $1.75 for 5 yards. What a deal!!! I will show you at a later time how I crunch mine up. I used to buy the white one and spray it with different colors, but now I just buy the colored ones and crunch them up. And let me show you this brand new stamp set called Christmas Vintage Labels One, which I am so in love with and here is why. See for yourself! It's a must have for this coming up Christmas for sure. And once again, don't forget to visit the rest of the Design Team's blogs to see what gorgeousness they have created with this stamp set. I know you will love them very much! Here is the list of the ladies, who are participating today. Thank you for visiting and have a wonderful day!! !